For twenty years, Olga Abramova, graduate of the State Conservatory in Saratov at the Volga, scholar of professor Lew Christiansen, has led the Folklore Centre in Barnaul. - In 1979, Olga Abramova founded in the Altai region her own ensemble under the name of Pesnokhorki. As a teacher and director of the Department for traditional music at the Barnaul Music College, she imparts traditional folklore, which she has been collecting in the Altai region for many years. Olga Abramova's talent and her outstanding leadership have created this exceptional situation in Siberia in as far as the national folklore of the Russians and Cossacks is transmitted and taught in the schools today. 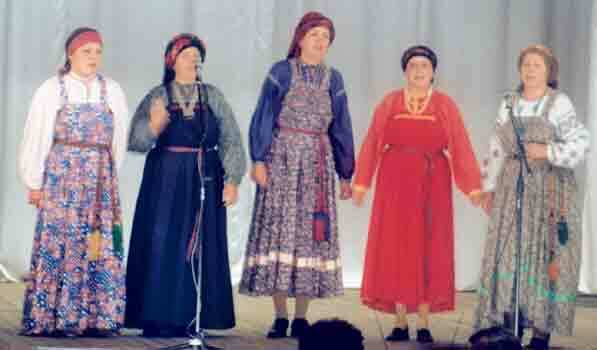 For 20 years already, the ensemble has been disseminating the songs collected by Olga Abramova at concerts, and like this contributed to the revival of this traditional folk art. This happened not only within the Altai region but all over Russia, and even in foreign countries, the ensemble found recognition for its activities. 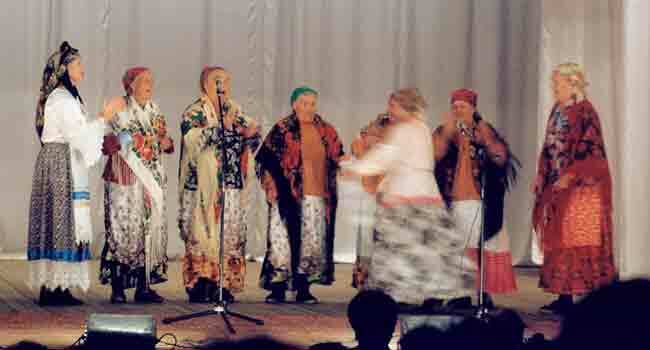 - In 1995, Olga Abramova and the members of the ensemble-members, assisted by the Culture Centre of the Siberian Cossack with Jurij Beloserzew at the top and the administration of the "Industrialnyj" borough of the city Barnaul with Gennadij Kulikow at the top, founded the Children and Youth Folklore Centre " Pesnokhorki ", where nowadays 50 teachers teach approximately 600 children and teenagers. - In 1998, the ensemble recorded two compact discs in Switzerland, published by Face Music: one disc with Russian songs from the Altai and one with Cossack songs. Diploma of the Russian television and radio broadcast competition "Voices of Russia". - Romania, Hungary, Poland, Germany, Spain, Sweden and Switzerland. 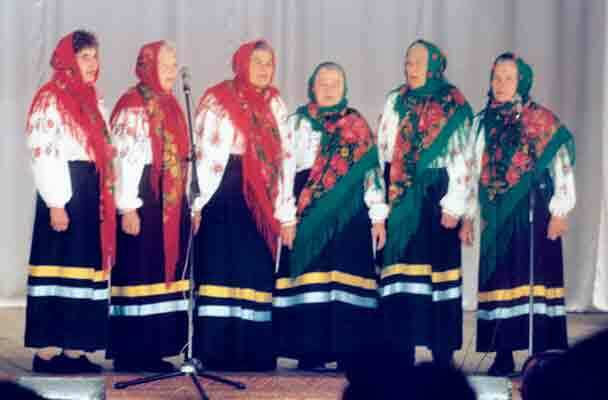 The ensemble has contributed a lot to the revival of the Cossack singing tradition. Thus, "new pages" have been opened in the history of Siberian folklore, above all with the so-called "strelowyjes pesni", the festival songs of the Cossacks that had never been performed at concerts and therefore, were unknown to many a folklore researcher. Russian traditional culture in the district Ustj-Koksinskij in the Altai. the scientific study of folklore in the Altai. The foundation of this Children and Youth-Folklore-Centre (CYFC) gave the ensemble Pesnokhorki scope and content in its research for inventive creativity as well as collecting of experiences with the growing up generation to whom all this should be transmitted. - The CYFC teaches in classes of the schools in the city Barnaul the traditional culture of the Cossacks and Slavic folk arts, in order to develop the inventive creativity and the social adaptation to the society as well as to prepare the children for the learning in the school. The pedagogues of the CYFC also work with children of pre-school age and in the kindergarten of the city Barnaul. 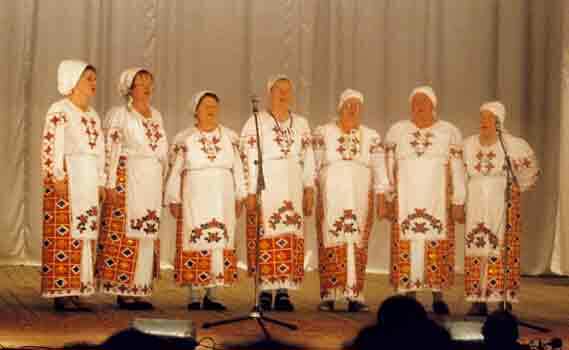 Won prizes at regional folklore festivals in Novosibirsk in 1997, 1998 and in 1999. Participated in exhibitions on decorative and applied arts organised by districts, the city and various regions. - Das KJFZ veranstaltet jährlich Weiterbildungskurse für Lehrer in den Fächern "Folklore in der Schule". - The collected material is evaluated at the CYFC for folk arts and ethnography and displayed in exhibitions of the ethnographic museum. - The CYFC organises folklore expeditions and continues to collect more material. Guests are welcome to participate in these expeditions. - The CYFC writes its own teaching aids. - Costumes from the Altaisky-Kray Region: 1. - 2. - 3. - 4. - 5. - 6.